It will be all black on the outside. Is there any way to connect this to a bowling bag or is it designed to be carried by itself? It is designed to be carried. Will size 14 shoes fit in this bag? 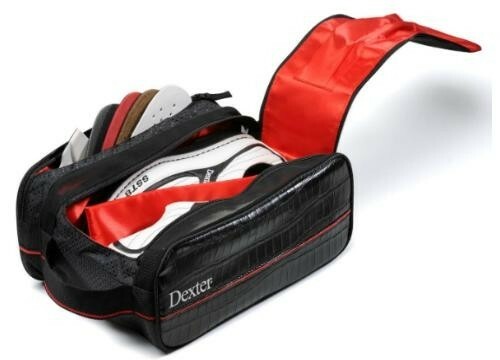 Is the Dexter Limited Edition shoe tote, meant to be carried out side of the bowling bag? Or will it fit into a the top of three bag roller shoe compartment ? It is meant to be carried outside of a bowling bag. Due to the time it takes to produce the Dexter Limited Edition Shoe Bag ball it will ship in immediately. We cannot ship this ball outside the United States.